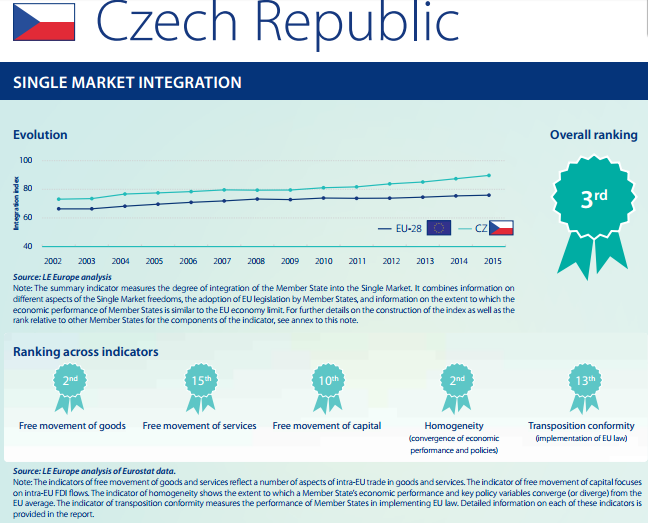 EU Single Market: Czech Republic ranked as 3rd most integrated economy. 2nd in free movement of goods. 15th in free movement of services. GDP per capita rose by 2.6% since 1990 due to single market. Employment grew by 129,000 jobs since 1990 due to single market. Consumption grew by 440€ per household since 1990 due to single market. Investment grew by 1150€ (in millions) since 1990 due to single market. Among EU-28 Member States, Hungary, Lithuania, Slovakia and the Czech Republic show some of the highest levels of international trade (as a proportion of GDP), as well as of intra-EU trade in goods (as a proportion of total trade in goods). The highest percentage of intra-EU trade in goods is shown by Slovakia (70.4%), closely followed by the Czech Republic (64.8%), Lithuania (63.7%), Hungary (61.6%) and Belgium (58%). The highest scoring countries on the Single Market integration index in 2015 were Malta (565.6) and Luxembourg (102.6), due specifically to their very high scores on the indicator of capital movement. Both countries can be regarded as outliers because the extent of Single Market integration of these two countries, as measured by the summary indicator, is so different from the integration shown by other Member States. The next highest scores are achieved by the Czech Republic (89.7), Ireland (88.7) and Slovakia (88.3). In contrast, the lowest scoring country was Greece (54.3), followed by Cyprus (65.3), the UK (65.6) and Italy (67.6).